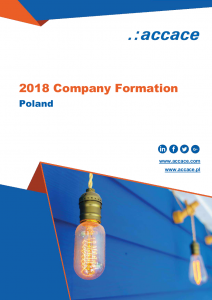 The main types of companies in Poland are Partnerships (Registered Partnership, Professional Partnership, Limited Partnership, Limited Joint-Stock Partnership) and Capital companies (Limited Liability Company, Joint-Stock Company). There are also 2 other alternatives (Branch and Sole Proprietorship), but special conditions apply. There are no requirements regarding the amount of company’s capital. The business name of the Registered Partnership should include the surname or the business name of at least one partner. In order to establish a Registered Partnership, the founders of the company have to adopt articles of partnership. The articles of partnership shall be made in writing, or else they will be invalid. Next, the motion to the National Court Register should be prepared. The Registered Partnership is considered established from the date of its registration at the commercial register. Each partner of a Registered Partnership is liable for the obligations of the company without limitation with all his assets jointly and severally with the remaining partners and the partnership. However, a creditor of the partnership may conduct execution from the partner’s assets only if execution from the assets of the partnership proves ineffective. Each partner has the right to represent the company. The right of representation includes all acts in court and out of court and cannot be limited with effect towards third parties. The partner may be deprived of the right to represent the partnership only for significant reasons under a final and court decision. Management of the affairs of the partnership may not be entrusted to third parties to the exclusion of the partners. Management of the affairs of the partnership may be entrusted to one or several partners under the articles of partnership or under a subsequent resolution of the partners. In such a case, the remaining partners are excluded from managing the affairs of the partnership. The business name of the Professional Partnership should include the surname of at least one partner. In order to establish a Professional Partnership, the founders of the company have to adopt articles of partnership. The articles of partnership shall be made in writing, or else they will be invalid. Next, the motion to National Court Register should be prepared. The Professional Partnership is considered established from the date of its registration at the commercial register. Only natural persons qualified to pursue liberal professions, i.e. legal advisers, notaries, doctors etc. can be partners of Professional Partnership. A partner is not liable for the obligations of the partnership which arise in connection with the pursuit by the remaining partners of the profession in the partnership, or for the obligations of the partnership which arise as a result of acts or omissions of persons employed by the partnership under an employment contract or another legal relationship who have been guided by another partner in the provision of services connected with the objects of the partnership. The articles of partnership may provide that one or more partners agree to be liable as a partner of a Registered Partnership. Each partner shall have the right to represent the partnership individually, unless the articles of partnership provide otherwise. A partner can be deprived of the right to represent the partnership only for significant reasons under a resolution adopted by a majority of three-fourths of the votes in the presence of at least two-thirds of the total number of partners. The articles of partnership may provide for stricter requirements for such a resolution. Such depriving of a partner of the right to represent the partnership is effective from the date of registration of this fact in the commercial register. The articles of partnership of a Professional Partnership may provide that the management of the affairs and the representation of the partnership be entrusted to the management board. The business name of the Limited Partnership should contain surname or business name of at least one of the general partners. The surname of the limited partner may not be placed in the business name of the partnership or else that limited partner shall be liable to third parties like a general partner. In order to establish a Limited Partnership, the founders of the company have to adopt articles of partnership. The articles of partnership of a Limited Partnership shall be made in the form of a notarial deed. Next, the motion to National Court Register should be prepared. The Limited Partnership is considered established from the date of its registration at the commercial register. There are 2 types of partners in a Limited Partnership: general partners and limited partners. A general partner is liable to the creditors for the obligations of the partnership without limitation. A limited partner is liable only up to the amount specified in the articles of partnership. Such amount is set up individually for each limited partner. The limited partner is released from liability up to the value of contribution made to the partnership. Unless the articles of partnership provide otherwise, the limited partner’s contribution maybe made in a value lower than this specified amount. However, a decision of the partners to release the limited partner from the obligation to make a contribution shall be invalid. The Limited Partnership is represented by the general partners, who are not deprived of the right to represent the partnership under the articles of partnership or a final and non-appealable court judgement. A limited partner may represent the partnership only as a proxy. The affairs of the company are managed by the general partners. A limited partner does not have the right or obligation to manage the affairs of the partnership, unless the articles of partnership provide otherwise. The minimum capital in a Limited Joint-Stock Partnership amounts to PLN 50,000. The nominal value of the share cannot be lower than PLN 0.01. The business name of the Limited Joint-Stock Partnership should include the surnames of one or several general partners. The surname of a shareholder cannot be placed in the business name of the partnership or else that shareholder shall be liable to third parties like a general partner. For establishing a Limited Partnership, the founders of the company have to adopt a statute of the company. The statute of a Limited Joint-Stock Partnership should be made in the form of a notarial deed. Next, the motion to National Court Register should be prepared. Like other partnerships, Limited Joint-Stock Partnership is considered established from the date of its registration at the commercial register. In a Limited Joint-Stock Partnership there are 2 types of partners: general partners and shareholders. General partners are liable for the obligations of the partnership without limitation, while the shareholders are not liable for company’s obligations. The partnership is represented by the general partners, who are not deprived of the right to represent the partnership under the statute or a final and non-appealable court judgement. Any subsequent deprivation of a general partner of the right to represent the partnership should constitute an amendment to the statute and requires the consent of all the remaining general partners. A shareholder may represent the partnership only as a proxy. Affairs of the company are managed by general partners. The statute may provide that management of the affairs of the partnership shall be entrusted to one or several general partners. An amendment to the statute depriving a general partner of the right to conduct affairs of the partnership or granting such right to a general partner who was previously deprived of such right shall require the consent of all remaining general partners. A supervisory board may be established in any Limited Joint-Stock Partnership. If there are more than twenty-five shareholders, the creation of a supervisory board is obligatory. The members of the supervisory board shall be appointed or revoked by the general meeting. The share capital of a Limited Liability Company shall be at least PLN 5,000. The share capital of the company can be divided into shares of equal or non-equal nominal value. However, the nominal value of a share may not be lower than PLN 50. The shares may not be subscribed for the amount below their nominal value. The amount of contribution shall not be lower than the share capital. There are no requirements regarding the business name of the Limited Liability Company. To establish a Limited Liability Company, the founders of the company have to adopt articles of association. The articles of association should be made in a form of notarial deed. In contrast to the partnerships, capital companies can start their activity right after execution of the articles of association. Until the date of registration at the commercial register, capital companies are obliged to add to their business name the term “in organization” (in Polish “w organizacji”). After the registration the companies obtains legal personality. The shareholders of the Limited Liability Company can be natural persons, as well as companies. A Limited Liability Company cannot be formed solely by another single-shareholder Limited Liability Company. The shareholders are not liable for the obligations of the company. The management board manages the affairs of the company and represents the company. The management board is composed of one or more members. Members of the management board are appointed and dismissed by a resolution of the shareholders, unless the articles of association provide otherwise. If the management board comprises several members, the rules for representation should be stipulated in the articles of association. If the articles of association do not include any provisions in this respect, representations in the name of the company may be made by two members of the management board acting jointly or by one member of the management board acting together with a commercial proxy. The articles of association may create a supervisory board or an audit committee or both. In companies where share capital exceeds PLN 500,000 and where there are more than twenty-five shareholders, the establishment of supervisory board or audit committee is mandatory. The supervisory board (or audit committee) consists of at least three members appointed and dismissed by a resolution of the shareholders. The articles of association may provide a different method of appointment and dismissal of members of the supervisory board. The supervisory board exercises permanent supervision over all areas of the activities of the company. However, the supervisory board does not have the right to give the management board any binding instructions with respect to the management of the affairs of the company. The minimum amount of share capital in Joint-Stock Company is PLN 100,000. The share capital shall be divided into shares of equal nominal value. Nominal value of the share may not be lower than PLN 0.01. The shares subscribed for in-kind contributions shall be paid in full not later than within a year from the date of registration of the company. The shares subscribed for cash contributions shall be paid prior to registration of the company to the extent of at least one fourth of their nominal value. If the shares are subscribed solely for in-kind contributions or for in-kind contributions and cash contributions, the share capital shall be paid in prior to registration to the extent of at least one fourth of its amount. There are no requirements regarding the business name of the Joint-Stock Company. In order to establish a Joint-Stock Company, the founders of the company have to adopt statute of the company. The statute of the Joint-Stock Company should be made in a form of notarial deed. Establishment of a Joint-Stock Company requires also the consent to the formation of the Joint-Stock Company and the wording of the statutes, as well as to the subscription for the shares. The consents should be adopted in a form of one or more notarial deeds. The shareholders of the Joint-Stock Company can be natural persons, as well as companies. A Joint-Stock Company may not be formed exclusively by a single-shareholder Limited Liability Company. The shareholders are not liable for the obligations of the company. The shareholders are not liable for the obligations of the company. There are two kinds of shares: registered shares and bearer shares. The registered shares indicate the shareholder. The registered shares certificate can be issued before making a full payment. The statute can state that the sale of registered shares requires a consent of the company or limits such sale in a different way. The bearer share does not indicate entitled party, which is the holder of the share certificate. Such share cannot be issued before the full payment. Sale of the bearer shares cannot be limited. The change of the ownership of the bearer share requires handing over the share certificate. Upon the request of shareholder, registered shares can be changed to bearer shares (or vice versa), unless the law or the statute provide otherwise. The management board manages the affairs of the company and represents the company. The management board is composed of one or more members. Members of the management board are appointed and dismissed by the supervisory board, unless the statute provides otherwise. The board member can be dismissed or suspended also by the general meeting of the shareholders. The board members can be appointed for maximum 5 years term of office. If the management board comprises several members, the rules for representation should be stipulated in the statute. If the statute does not include any provisions in this respect, representations in the name of the company may be made by two members of the management board acting jointly or by one member of the management board acting together with a commercial proxy. Establishment of a supervisory board in the Joint-Stock Company is mandatory. The supervisory board exercises permanent supervision over all areas of the activities of the company. The supervisory board consists of at least three members (five in case of public companies) appointed and dismissed by the general meeting of shareholders. The statute may provide a different method of appointment and dismissal of members of the supervisory board. Members of the supervisory board can be appointed for maximum 5 years term of office. Foreign entrepreneurs can conduct business activity on the territory of Poland trough a branch. A branch can only conduct such activity which coincides with the scope of business activity of foreign entrepreneur. According to Polish law, the branch is considered a part of mother company, not an independent entity. However, the branch may hire employees on its own behalf. The branch operates under the same business name as the mother company. To the business name should be added the form of business of the mother company translated into Polish (e.g. LTD = spółka z ograniczoną odpowiedzialnością) and the term “oddział w Polsce” (in English: branch in Poland). The sole proprietorship is an alternative for establishment of a company. In this case natural person conducts business activity on his/her own behalf. Such entrepreneur is solely liable for obligations connected to business activity without limitation. Natural persons who conduct business activity are registered in the Central Registration and Information on Business (CEiDG). The entrepreneur can register in CEiDG, tax office and social insurance institution (ZUS) with a single application. Such application can be submitted electronically by CEiDG website, sent by post to selected municipal office or filed in person in selected municipal office. Together with the application, the entrepreneur shall provide a statement that he owns legal title to the real estates, with addresses already entered into the register (i.e. correspondence address and all addresses of conducting business, including main address of business and addresses of branches – if there are such). The legal title can be for example a property sales agreement or a lease agreement. Such legal title is not attached to the registry motion, but the ministry responsible for economic affairs may request the entrepreneur to provide it within 7 days from receiving the request. If the entrepreneur will not provide it or changes the addresses in the register, the ministry can decide on erasing the entrepreneur from the register. All types of companies have to be register at the commercial register held by district courts. The duration of the registration procedure depends on the relevant court. The procedure in Warsaw currently lasts approximately 2 weeks. The court fee for registration of the company in the National Court Register amounts to PLN 600. Corporate income tax is levied at a rate of 19% (standard rate) or 15% (reduced rate for small taxpayers and new companies in the first year of business activity). Withholding tax of 19% is levied on income from participation certificates, certain debentures, vouchers and investment coupons; and interest from bank deposits and current accounts in general. Residence – A company is treated as resident if it has its legal seat or place of effective management in Poland. Taxable income – Resident companies are taxable on their worldwide income, including capital gains. The taxable income is computed on the basis of the accounting profits and is adjusted for several items as described in the tax law. Tax period – Calendar year or the financial year chosen by the taxpayer. Tax returns and assessment – The taxpayer has to calculate the tax due in the corporate income tax return (self-assessment). The deadline for filing the return is by the end of the third month following the end of the tax year. The filing deadline cannot be extended. Tax advancement – Monthly. Quarterly in the first year, or if gross sales did not exceed EUR 1,200,000 in the previous year. A new business entity established during the tax year is required to make advance tax payments. Deductions – As a general rule, expenses incurred in connection to obtaining, ensuring and maintaining taxable income are fully deductible, unless they are listed as non-deductible items. Some items are deductible only up to a limit set by the law. Carry forward of losses – Tax losses may be carried forward up to 5 tax years. During each year the company cannot utilize more than 50% of the loss. Intercompany dividends – Dividends paid out of profits are taxed at 19% rate. However exemptions from the EU Parent-Subsidiary Directive apply. Revenues derived from activity in Special Economic Zones (SSE) are exempt up to certain level (depending on amount invested and workplaces created). A company can deduct expenses on Research and Development (R&D), including development of prototypes and pilot projects, demonstration, testing and validation of new or improved products, processes or services whose main purpose is to improve the technical Encoding Products. In 2017 the R&D relief is from 30% up to 50% of qualified expenses.